Golf is a sport that requires good range of movement, coordination, flexibility, timing and muscle control. It also puts a large amount of strain on your joints and muscles, especially if you are not warming up correctly or have enough range of motion. Without a warm-up, muscles and soft tissues are cold, inflexible and less forgiving. When muscles are warm, they have increased elasticity, pliability and can withstand forces much better, thus reducing the risk of injury. The best warm-up for any sport should mimic the activity, to ensure that your brain can begin communicating with our muscles about the activity and you can begin to increase your range of motion of the specific joints used in activity. 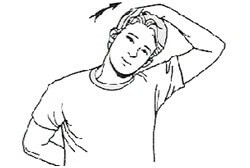 A good warm up should also be followed by appropriate stretches to increase flexibility and range of motion. 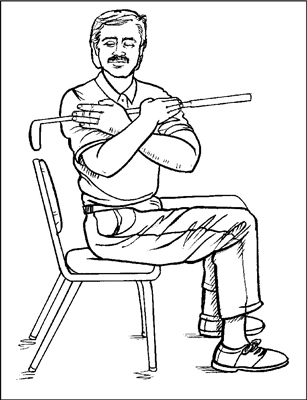 Here are our best 6 essential stretches to do for any golfer before they play a round. Tuck the pelvis under, creating a posterior tilt of the pelvis; arch the back, creating an anterior tilt of the pelvis and return to a neutral spine. Repeat five times in each direction. Cross your arms across you’re chest. Inhale as you rotate from the core as you got he the left. Exhale as you rotate back to the center. Repeat 10 times in each direction. 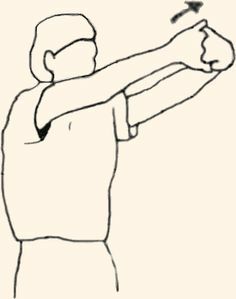 Continuing in your address position, extend the arms to shoulder height and rotate from the core. Repeat 10 more times. To stretch the left hip flexors kneel on your left knee and put your right foot in front of you such that your right hip and knee are about 90 degrees. Put a cushion on the floor for your knee if you find this uncomfortable. Put your left hand on your left hip and push your left hip forward so that it is in front of your left knee. Keep your chest up and don’t bend forward at the hips. Then repate on the other side. and squeeze the shoulder blades together. Repeat five times. For any questions, or if you would like us to go through this in more detail, please come in and see us today. You can call and book an appointment by calling 99712185.